When: Friday November 12th @ 10:00p.m. 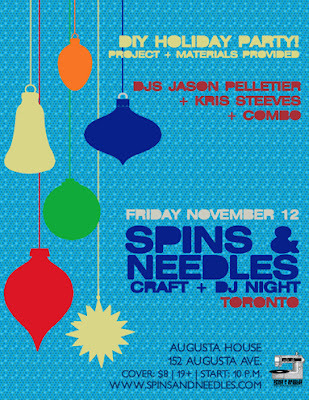 Spins & Needles Craft + DJ Night is a creative night out that mixes do-it-yourself projects with funky beats spun by DJs in galleries, bars and other public spaces in Canada and beyond. The event was conceived and created in 2005 by crafter/designer Melanie Yugo and DJ Jason Pelletier. Known for its alternative take on the nightlife experience, the event travels internationally to cities such as Toronto, Montreal, Ottawa, Halifax, New York, San Francisco, Austin, Chicago and London (UK) and has collaborated with significant players in art and cultural scenes such as Maker Faire, Renegade Craft Fair and Etsy Labs. Spins & Needles played a large role in inspiring Canada's national art institution, the National Gallery of Canada, to create their afterhours event Artsparks . Get in the holiday spirit and get those gifts made early at our 6th annual holiday craft-mas installment in Toronto! Cover: $8 - includes access to all materials and instructions. DJs: DJs Jason Pelletier + Kris Steeves + Combo will hit the decks throughout the night spinning some jackin' house, funk and other assorted beats. Projects: Handmade holidays! Whip up some practical gifts, decorations and other stuff to avoid the last minute rush!